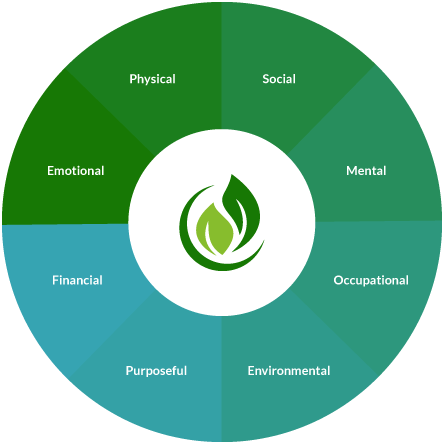 A holistic approach to well-being for sustainable change based in neuroscience, mindfulness, and positive psychology. We practice a holistic approach to health and wellness. We look at how all areas of your life are connected. Does stress at work or in your relationship cause you to over-react or over-eat? Does lack of sleep or low energy prevent you from performing at the top of your game? Are you not as productive as you would like to be to fulfill your goals and responsibilities in your personal and professional life? As we work together, we will look at how all parts of your life affect your health and well-being as a whole. Prananaz’ game-changing approach is based in neuroscience – a rich mix of perspectives and perceptual and behavioral skills and tools for personal development and enhanced interactions with others. Your processes of decision-making, communication, motivation, and learning will become more clear and effective. Our objective working together will contribute to increased choice leading to more fulfilling lives. In other words, your frame of mind will expand allowing for more possibilities. We will work to reach your goals in areas such as sustaining high performance, improving sleep quality, managing stress and building resilience, and optimizing vitality, creativity, and success. As we work together, you will develop a deeper understanding of the lifestyle choices that work best for you and implement lasting changes that will significantly improve your enjoyment of life. 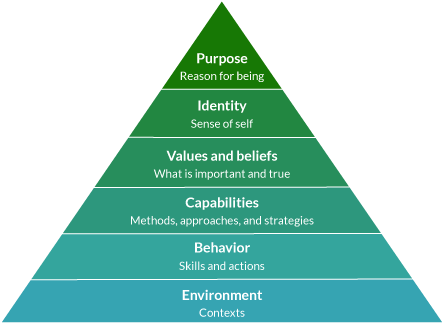 The Six Neuro-Logical Levels of Change model by Robert Dilts – inspired by Gregory Bateson – is used as a general roadmap for the process of sustainable change, and to design action plans for both organizations and individuals. There are natural hierarchies in the process of learning, change, and communication. Making a change at a lower neuro-logical level may, but not necessarily, affect an upper level. However, a change at an upper level will have a distinct impact on the levels below it in order to support the higher level of change. This framework offers insight into how belief and action and behavior reinforce one another. It helps identify what promotes or limits our effectiveness as leaders and as organizations. Have you ever received good advice that you were unable to follow? Has your doctor ever recommended a lifestyle change that you found to be difficult to implement or unsustainable over an extended period of time? Have you ever wanted something in your life, but found you could not achieve it alone? Wellness Coaches are knowledgeable advisors who provide ongoing support and guidance as you set goals and make sustainable changes that improve your health and happiness. At Prananaz, we listen deeply and help you discover the hidden beliefs that keep you stuck and prevent you from taking action. We determine what changes are necessary for you and help you create new beliefs and lifestyle choices that make transformation inevitable. Our holistic wellness programs extend beyond a traditional wellness program by cultivating an organizational culture of well-being. Ready to improve employee engagement?